Hot Spa | Kannonzaki Keikyu Hotel official website. The hotel is only about one hour from Haneda Airport. Enjoy the relaxation and comfort close to Tokyo but unleashed from the hustle and bustle. After treating your body and mind, fine dining in the hotel awaits you. We provide towels and other essentials for you. Please enjoy these luxurious and relaxing moments. *We provide bath towels and face towels for customers. *Shampoo and conditioner are complimentary in the bathroom. *Discount tickets cannot be used during New Year holidays, Golden Week, and Japanese summer holidays (Obon holidays). 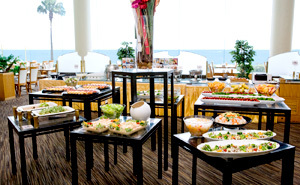 A great deal including SPASSO entrance fee and buffet lunch at Restaurant Hamayu. *Please note that tickets for the package may be limited at times of congestion. *The package plan is not available during Golden Week, Japanese summer holidays (Obon holidays), Silver Week, and New Year holidays. *Pregnant (either early stage or close to full term). *Suffering from any skin disease or other infectious disease. *The following are strictly prohibited: People with a tattoo regardless of its size. People who are drunk. *We strictly prohibit any person who causes distress to other guests. We may refuse entrance or ask you to leave the facility. *Unaccompanied elementary school or junior high school students are not allowed to enter after 6:00 p.m.
*Adult supervision is required if 17 years of age or younger to enter the facility after 9:00 p.m.
*The entrance fee during New Year holidays, Golden Week, and Japanese summer holidays (Obon holidays) is the same fee as Saturday/Sunday/Holidays. *Please refrain from entering if you have a high blood pressure or heart disease. *If you are pregnant or ill, please follow the instructions of your doctor. *Please be careful as the floor is very slippery. *People who are drunk are strictly prohibited from bathing. *Please do not bring any food or beverages into the bathing area. *Before you have a soak in the bath, wash thoroughly under the shower. *Do not lean over the edge of the outdoor hot spring because it is very dangerous. *Please refrain from bathing infants with diapers. *Elementary school students require supervision by the same gender adult. Do not bring a child of the opposite gender aged 7 years or older into the bathing area.